... Described an investigation of the remains of an early human ancestor called Austalopithecus sediba. Au. sediba lived about 2 million years ago in southern Africa, and decided, as "a matter of choice, not necessity," to forgo the grasses that the rest of its hominin relations were enjoying at the time and to venture into the woods to eat "almost exclusively a diet of leaves, fruits, wood and bark." I was going to include the story in my recent post, Diet Of Early Man: Grain, but didn't because it described an ancestor that was, in my opinion, too far removed from who we are today. Its brain was smaller, its skeleton and intestinal tract different. Wikipedia says that the entire genus, Australopithecus, became extinct about 2 million years ago. The researchers themselves are still pondering "how or if [Au. sediba] is related to modern humans and just where it fits on the hominin family tree." I'm not a paleoanthropologist or evolutionary biologist or anything of the sort. I don't know how the diet of these much older relatives impacts modern humans' diet, except for my casual reading. (I enjoyed Wrangham's "Catching Fire," a good popular book on the topic.) I don't mean to sound flippant but if it's found that prehumans ate something not sold at the grocery store, I'm probably not going to eat it. Not that everything sold in grocery stores is something I eat. Although I would like to try sorghum. Study: Autralopithecus Diet "Almost Exclusively" Plant Food – Researcher Says "Humans Are Basically Grass-Eaters"
He said the findings support his hypothesis that "humans evolved as primarily plant- and probably, grass-product eaters." Don Matesz has an interesting blog. He followed a more meat-based paleo diet for about 14 years but gave it up last summer for "a plant-dominated, high-carbohydrate diet supplying significantly less than 30% of energy from fat:" Farewell To Paleo. 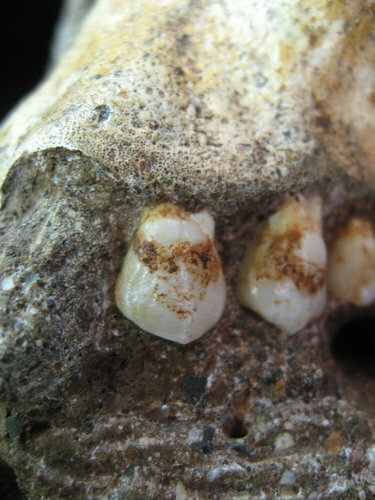 ________The photo is from the NYTs: "the left anterior premolar of the Australopithecus sediba." Tooth enamel and tartar were studied to determine diet. Those are some fine teeth. Do you think they brushed? The big question is, "Did they floss?" Only the ones they wanted to keep, Dr. Mel. Only the ones they wanted to keep.